What do you do with the animals once they are captured? Can't the city or county take care of the problem for free? Can my regular pest control company do this? Do you take care of termites or other insects? Do you use poisons or rodenticides? Do you carry workers comp? Why do you charge the prices you do? What if I see an alligator? Do you pick up orphaned animals? What if I find an injured or baby bird? Will you help out with dog or cat issues? Which animals don't you handle? Have you ever been bitten by an animal? What is the strangest thing you've ever caught? Do all wild animals carry rabies? What health risks do animals pose? If the animal is healthy and it is legal to do so, I relocate it far outside the city at one of several privately owned relocation points at which I have permission to release wild animals. It is not legal to relocate wildlife to public lands, so if you trap your own animal (and this one step probably won't solve your wildlife problem) don't bring it down to the local park. All relocated wildlife should be brought at least ten miles from the capture site, and released in an area in which it won't pose a problem - that is, wildlife should not be relocated to urban areas. If the animal is sick, old, or injured, and I do not think that it stands a good chance of survival, or if the law dictates that I must, I will humanely euthanize the animal. I use a CO2 chamber - it is my belief that this is the most humane way to put an animal down. The animal breathes in carbon dioxide instead of oxygen - it remains comfortable, unlike drowning, but it gets dizzy and passes out and gently goes to sleep. I don't have to put down many animals, and in truth I don't always have a lot of wildlife in my possession because I ultimately aim to solve the root of the wildlife problem - say, by sealing off the holes they use to enter your home - than just trapping everything in sight. Still, there are rare times when I must put down an animal. Overall, I care a lot about the animals that I deal with, and I aim to be very humane. No. There is no city animal control, and the county animal services handles only domestic animals - dogs and cats. They handle things such as bite reports, pet abuse complaints, domestic disputes, barking or dangerous dogs, etc. As recently as 10-15 years ago, depending on county, the county animal services would assist in certain wildlife removal cases. But even then, they wouldn't do professional wildlife control work - they'd slowly get a trap out to you, perhaps catch an animal, perhaps not. They would not, for example, inspect your home and attic, remove a litter of baby raccoons from the attic, trap the mother, seal off all the entry points, and clean and decontaminate the droppings left behind. They'd drop a trap on the ground and maybe catch a stay opossum. Wildlife control is specialty and skilled work, and not something to expect a government agency to take care of. If you have a problem with any type of wild animal, say a squirrel, rat, opossum, raccoon, bat, or snake, then you have to call a state licensed nuisance trapper. In my biased recommendation, I suggest that you call the finest nuisance wildlife control operator in the land - David Seerveld of 24/7 Wildlife Removal. Can't my regular pest control company take care of this? Almost certainly not - pest control companies are licensed and trained in poison use, particularly for insects. They usually spray poison on the yard or house, and charge for monthly or quarterly contracts. They use the same methods when they try to control mice & rats (with inferior and costly results) and even have been known to illegally try to use poisons on other animals, such as bats. A wildlife problem is VERY different from an insect problem, and should be dealt with only by a professional nuisance wildlife trapper who has extensive experience dealing with wildlife. Most wildlife cases are far more involved than insect cases, and involve hands-on removal of animals, not a simple spray solution. If you do call your regular exterminator to take care of a wildlife issue, beware - they may recommend a lousy company that charges obscenely high prices and gives a kickback to the exterminator. NO. Poisoning animals is a ridiculous, ineffective, inhumane, and often illegal approach to wildlife control. First of all, poisons are typically only used for rat control - rodenticides. There are no legal or registered poisons for use on other animals, such as squirrels, raccoons, opossums, etc. Second of all, poisons simply DO NOT WORK. They will kill only a % of the rats, maybe half, and if the root of the problem is not solved, new rats will keep coming and coming. Plus, you'll be left with stinking dead rats in your attic and walls. Finally, I consider poisons inhumane - it's a very unpleasant death that they cause - if you care, anyway. The most important thing to realize is that poisons only scratch the surface of solving the problem. I use a process called integrated pest management. IPM involves the combined use of trapping, excluding, and habitat modification to take care of the problem. If there are rats in your attic, I inspect the entire house and, most importantly, seal points of entry so that no rats can ever get into your home ever again, eliminate food access, and trap and remove all remaining rats, and the problem is permanently solved. No. Insects fall under the umbrella of pest control, which is an entirely different field than nuisance wildlife control. If you have a problem with insects, you must contact a pest control company. Look in your local yellow pages under "pest control" for a phone number. I use whatever trap is most effective and appropriate for the situation that I am dealing with (as long as it is approved by the Florida Fish & Wildlife Conservation Commission). For the most part, I trap and remove animals in humane cage traps. Oftentimes, I am able to use one-way exclusion doors to let animals get out of homes, but not back in. I do not use lethal traps such as body-grip traps. These are illegal in Florida anyway. I began operating in 2000, giving me six years of experience currently. In that time I've done literally thousands of jobs, and I am often called upon to handle the toughest jobs that no other companies will handle. If you call a company that advertises "Serving Central Florida for over 50 years!" there's a good chance they'll send out a fresh technician with two weeks of training and a few months of experience under his belt. Yes. I am licensed by the state of Florida Fish and Wildlife Conservation Commission as a nuisance wildlife trapper, and I carry city and county occupational licenses. Yes. I carry commercial general liability insurance with coverage up to $500,000. I will provide a certificate of insurance upon request, or have my insurer send a direct certificate made out to you. I am in full compliance with Florida's worker's comp laws. Non-construction industry sole proprietors and partners are AUTOMATICALLY EXEMPT by Florida Law, from the provisions of Chapter 440, Florida Statutes (Florida Workers' Compensation Law). I can provide a letter from the state proving my exempt status. Nuisance Wildlife Control is a specialty business. It requires a unique set of skills and a great deal of knowledge and training. I began studying the field in college, and spent two additional years in an apprenticeship. It is a field with unique risks. Nuisance wildlife control operators take care of difficult problems that few people can properly, legally, or safely handle. I am not some bumbling redneck trapper. I am a college educated and state licensed professional. People seem to have no problem paying the electrician or plumber for their skills, and you won't find them crawling in a hot attic to remove a litter of raccoons with an angry mother raccoon lurking nearby! Please be aware that you are paying for a special service. I find that all of my customers feel that they have received a very good value, after they talk to me in person, and get their problem quickly and professionally taken care of. From my observations of competing company's price quotes, my prices average about 1/3 the average, for what I believe is the best work in the area. For a complete list of current prices, click here: prices for animal control in Orlando. Pretty much any form you prefer - cash, check, and major credit cards - Visa, Mastercard, American Express, & Discover. I don't handle alligators because of the special regulations behind this animal - all nuisance alligator complaints go through the state of Florida Wildlife Conservation Commission. If you need to report a nuisance alligator, call 1-866-FWC-GATOR (1-866-392-4286). They will typically only respond to calls for larger alligators. Anything under 5 feet isn't really be a threat to anything other than fish/frogs/turtles. ...note, these people will not pick up the animal for you. You must transport it yourself. You're in luck. Call Ann Young, "The Bird Lady". She is a world renown wild bird rehabber, and she runs a wild bird refuge right here at 205 Robin Road in Altamonte Springs, FL 32701. Her phone number is 407-339-2900. Please give her a donation so that she can continue to run her clinic. If you happen upon a bird of prey (hawk, falcon, owl, etc) call the Orlando Audubon society at 407-644-0190. Yes, for a one-time service fee I will come to the property, remove the dead animal, and dispose of the carcass in an acceptable manner. If you merely see a dead animal in the road, you can try the county services, and they may take care of it for you. No. I'm constantly harassed by phone calls about dog and cat problems. Confused people will call me, saying, "I'm calling to report that my neighbor has a dangerous pit-bull..." This is not my area of jurisdiction. 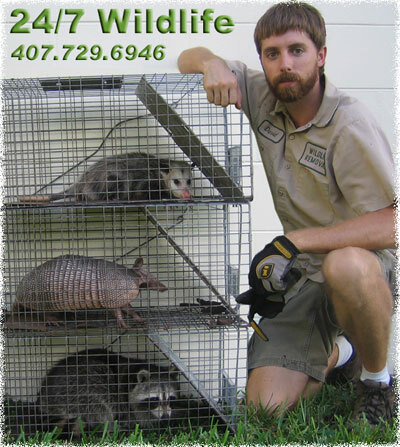 I run a privately owned wildlife removal business. For any problems with dogs or cats, call the county animal services. Their number can always be found in the blue pages (government listings) section of your local phone book. I occasionally deal with cat problems when the county won't - such as cats living in an attic. Almost any wildlife that a property owner deems a nuisance. This basically involves the following animals: Raccoons, armadillos, squirrels, opossums, snakes, bats, rats, mice, dead animals, and pigeons. I will assist with feral cats in cases of unwillingness by the county, such as cats in attics or under houses. I usually solve problems with animals living in people's attics, but handle a wide variety of human-wildlife conflict scenarios. Everyone asks me this, so I'll post it here. I've been bitten a few times, mostly because I've dealt with thousands of wild animals. However, never seriously. One time I accidentally reached my finger into a cage with a raccoon, and it lurched with lightning speed and took a chunk out of my right index finger. I've also been bitten by various non-venomous snakes, which I often capture by hand. For the most part an experienced wildlife operator should never be bitten. Any mammal can potentially carry rabies. However, there's only a few animals that seem to be relevant rabies vectors. In Florida, it's mostly raccoons and bats that are of concern. Otters, foxes, and some other animals may also carry and transmit rabies, but they're rare. Rabies is not terribly common here. I get phone calls like this all the time: "I just saw a raccoon outside during DAYLIGHT! It must have rabies!" This isn't true - raccoons are often active during daylight hours, especially females with young. Most cases of rabies transmission to humans in North America are actually caused by bats, but even this is a rare thing. I'm not a true expert regarding zoonotic diseases, but wildlife often carry several diseases that humans can contract, either through direct contact or contact of droppings, such as rabies, histoplasmosis, roundworm, Rat Bite Fever, Murine Typhus, Salmonellosis (bacterial food poisoning), Leptospirosis (Weils Disease), Trichinosis, Rickettsial Disease, Melioidosid, Pasteurellosis, and Brucellosis, possibly among others. Of course, venomous snakes can also pose a risk. Overall, I think risk of these diseases is rare, but I've heard of colleagues who have gotten seriously ill, and I always take precautions. Please see my wildlife diseases page for more info.